The music for the new album “We Are Together” was finalized in songwriting sessions, that took place in the village of Grand-Popo, Benin, West-Africa in April 2017. The band’s musical leaders Janne Halonen and Noël Saïzonou worked for two weeks by the beaches of Gulf of Guinea, writing and listening music, discussing directions and recording demos. However the sketching period of the songs took over a year, and in addition to Halonen and Saïzonou, those sessions were also attended by the band’s keyboardist Visa Oscar, drummer Juha Räsänen and bass player Sampo Riskilä. 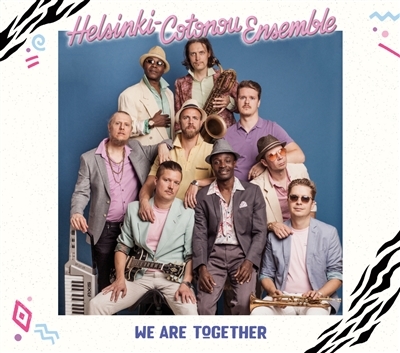 “Despite all our differences, at the end of the day we are all together on this planet.”, Janne Halonen explains the meaning of the album’s title “We Are Together”. “The title is also a phrase we use among the band members, when we part ways after spending a longer time period together, or when we manage to find a solution to a problem or an argument”. In addition to making “We Are Together”, since HCE’s previous album “The Road is Long - Live at Savoy Theatre” Noël Saïzonou has composed music and played the leading character in a Finnish National Theatre play “La mer si vaste”. The shows took place in January 2018. On stage the music was performed by another group led by Mr. Saïzonou: Trio Toffa. Meanwhile, between HCE records Janne Halonen produced a Finnish- Iranian group BaranBand in recording of their highly acclaimed debut album “Mn Bo To”. Finland’s largest newspaper Helsingin Sanomat ranked “Mn Bo To” among the best albums of 2017. Helsinki-Cotonou Ensemble was founded in 2012 at the Finnish-African Cultural Center, Villa Karo, in Grand-Popo, Benin. Ever since the band has released four albums and performed in nine countries.